​Many ask for the meaning of life and countless need better life conditions. God wants to save all people, now and for eternity. ​By the grace of God, I want to initiate and coach discipleship making community movements with blessing multiplication or help a little bit. This in trusting that God will do it. Please pray for this. I am contacting people via Linkedin in these far away countries to find persons of peace, people with motivation and people with competence for regional circumstances, as God puts them together and leads. Whoever seeks knowledge of God, healing, liberation from sin, love and reconciliation with God, or wants to grow, be ore fruitful in following of Christ, let me know if you want some loving help and coaching. All areas of life. Peace making, mediation and corporate coach - problem solving. For individuals, couples, families, organizations, political communities, regions. This is done by loving community with God, each other, personal, video or voice telephony/messages. Currently we are in Frauenfeld, Thurgau in Switzerland. See also the PDFs and links for multifold blessings. Who wants to help in the financing of the following trips or settlement, is cordially invited. Anyone who invests in this trip gets post-travel imagery and a video report and can follow the development and propagation that I have come to believe. Estimated cost: CHF / EUR 24'000. Reaching local people, traveling partially and staying with people of peace, dedicated hosts, rich and poor, showing them the things of the Kingdom of God, equipping the faithful for ministry, train to live with God and children, making others to disciples of Jesus which multiplicate. 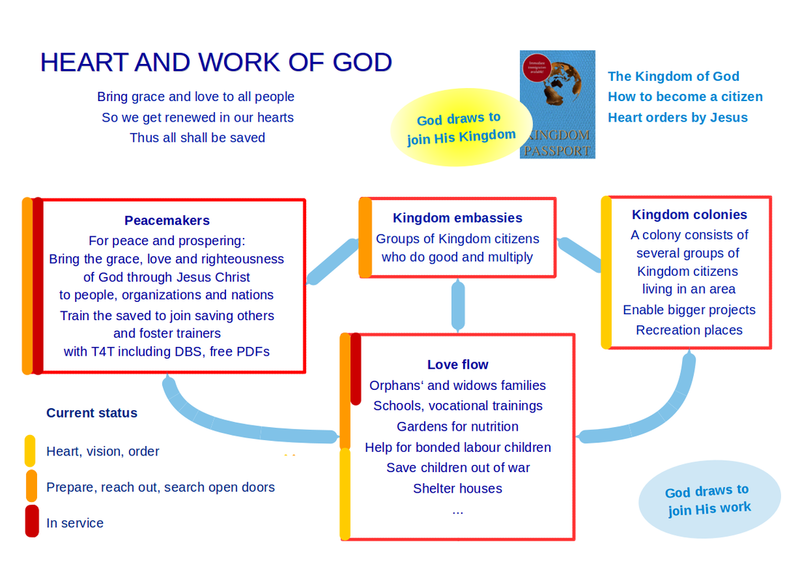 With Peace making offer as access strategy win hearts for God, coaching then with helpful 3/3-group process including DBS. More as God will lead. PDFs and links for multifold blessings. ​Anyone who invests will receive pictures and a video report after the first 7 weeks in Canada and will be able to follow the development and spread what I have come to believe God will do. Estimated cost: CHF / EUR 12'000. Then the cost recovery and blessing flow should come from the people we serve in Canada. 7,000 monthly living and service costs.